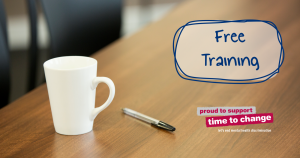 Hull and East Yorkshire Mind in partnership with Hull City Council are running taster mental health at work training sessions- free for Hull businesses. Want to know more about how to support staff with their mental health over a cuppa and some breakfast? This taster training is for you! The training will cover how to create a positive workplace wellbeing culture for mental health, and how to support staff and colleagues. It will also introduce you to the time to change pledge and how it can help you to break the stigma of mental health in the workplace. Please note: this training is for businesses within the Hull City Council boundary only. Places will be allocated on a 1st come, 1st served basis. If places become over-subscribed we will limit places to 2 per business. Places are free and a complimentary breakfast will be served.